Home / How Much Pearl Pigment do I need? 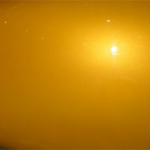 1 heaping tablespoon of metal flake per SPRAYABLE quart of base clear or Pound of clear powder coat for a light sparkle. 2 heaping Tablespoons of metal flake per SPRAYABLE quart of base clear or pound of clear powder coat for a heavy sparkle. Plan on 2-4 coats for even coverage. Adding to much flake to your quart can bog down your base clear and make it too difficult to spray from a normal sized tip 1.4, 1.5 size. Phantom Pearls go a long way! 1 level teaspoon will treat 1 SPRAYABLE quart of clear, 1, 25 gram bag will treat 1 gallon of SPRAYABLE clear base, 1-4 pounds of clear powder coat. Many people think that using more ghost pearl in the clear will give a stronger effect when in fact it can actually alter your base coat color. It is best to stick with the ratio and do more coats than to alter the ratio. For translucent/see through paint use 1,25 gram bag into 2 SPRAYABLE quarts of clear base. For a more solid/metallic type of paint use 1, 25 gram bag per SPRAYABLE quart of clear base. 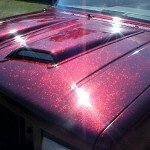 Candy Color Pearls can also be used to tint clear powder coat to create color matching powder to paint. Start with 1/2 bag per pound of clear powder. You can go as much as 1 bag per pound of clear powder as long as the pigment is staying suspended. in the clear powder. 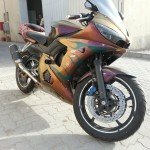 All of our products are used for custom paint and coatings. These ratios are all just starting points or beginning guidelines. 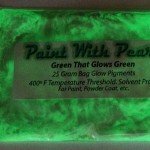 1, 25 gram bag of Thermochromic pigments or heat sensitive paint treats 1 SPRAYABLE quart of base clear. These products work much better in an oil or solvent based base clear. In using a 2 part clear allow the 25 gram bag of pigment to dissipate into a pint of reducer for 24 hours before adding the pint of clear paint. Although we have had customers get this pigment to work in powder coating we always suggest doing a test panel first. It has a high intolerance to UV light and heat. Please see the thermochromics page to read more about the details of this pigment. 1, 25 gram bag of Chameleon Pearl Pigment will treat 1 quart of SPRAYABLE base clear. It is best to go over a black base for the most color change effect but putting chameleons over different colors can give great results as well. 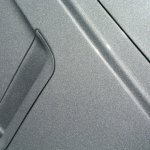 It is always best to take some time and spray a test panel to get optimal results. There are several types of Colorshift Pearls. There are the 39 series which are colored in the bag and the 59,69 and 79 series or as we call “Ghost Colorshift Pearls” that are a white colored powder in the bag. These Ghost Colorshift Pearls can go over white or black and have even been used in conjunction with Thermochromic Pigments or heat sensitive paint to give a stunning result. Glow in the Dark Pigments will treat 1 pint of SPRAYABLE base clear. Glow in the darks are pretty dense and can sink to the bottom of the gun or paint can if not constantly agitated. If using a siphon feed gun, add a couple of marbles to it in order to keep the pigment suspended. Mix this paint as needed so as no to have problems with coagulation. A glow time of up to 6 hours can be achieved with a heavy build up of pigment in a concentrated area. The more pigment you have, the longer it will glow.